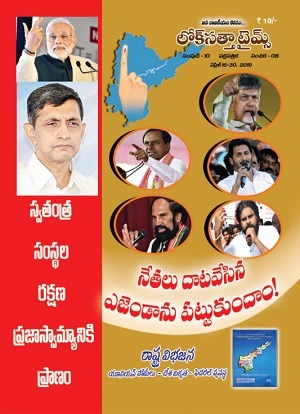 Loksatta Party national President Dr. Jayaprakash Narayan today lashed out at the TDP, TRS and YSRCP for making irresponsible promises that ruin the economies of the two emerging States of Telangana and Andhra Pradesh and bury the future of the youth. Addressing a media conference, Dr. JP said that these parties do not utter a word in their manifestos on fulfilling their constitutional obligations but make wild promises solely with an eye on garnering votes in the elections now under way. Dr. JP reeled out facts and figures to drive home the point that the promises costing tens of thousands of crores of rupees can never be fulfilled going by the combined State’s receipts and expenditure. For instance, the YSRCP promises to deposit Rs.500 a month per student if parents send their children to school and Rs. 700 to Rs.1000 a month for students in colleges. This alone will cost over Rs.13000 crore every year and will do nothing to improve the quality of education. Dr. JP said the party’s move is devoid of any rationale since there is no problem with enrolment of children in schools. In fact, school enrolment in the 5-10 age group is occasionally even 105 percent as even 11-year-olds happen to be students in some cases. The party that promises the incentive for enrolment in schools is silent on improving the quality of education. Most students in most schools cannot do simple division or multiplication. India occupies the 73rd place among 74 countries in the world for quality of education. The TDP and the YSRCP have promised loan waivers for self-help groups and the TDP and the TRS for farmers. Roughly, the loans to be written off for the two groups in the united State work out to Rs.70000 crore. 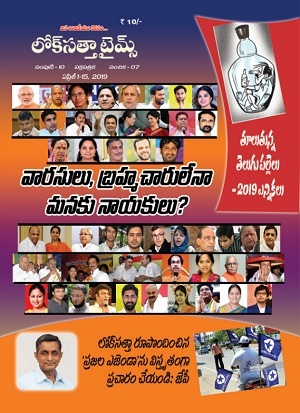 Some of these parties’ promises include higher pensions to the aged, widows and physically challenged, additional gas subsidy, construction of houses costing Rs.3 lakh each in 125 square yards, allocation of three acres of cultivable land to each landless family, irrigation facility to one lakh acres in every constituency, generation of 13000 mw of additional power in Telangana and 12 percent reservations for minorities. Dr. JP pointed out that the united State’s total receipts in 2012-13 including loans amounted to Rs.127000 crore while the expenditure was Rs.129000 crore. The two States will have deficits to start with if the pay revision for staff is considered. How could the upcoming Governments make good their promises against such a backdrop, Dr. JP asked and added that the parties are taking people for a ride with an eye on votes in the coming elections. Dr. JP asked how minorities could be given 12% reservations as the reservations already in force account for 50 percent, the ceiling imposed by the Supreme Court. How could three acres of land be given to each landless family since land cannot be manufactured in a factory? How could seven hours of power be supplied to the farm sector during the peak load time? Generation of an additional 13000 mw of power and the building of a network for its transmission and distribution will together cost Rs.100000 crore. Dr. JP regretted that although elections from panchayats to Parliament are taking place within less than two months in Andhra Pradesh, political parties have failed to focus attention on issues that matter most to people like provision of quality education, healthcare, safe drinking water, employment opportunities, good governance, rule of law and election of people with integrity and competence. The united Andhra Pradesh Government has not constituted village courts although the Government of India has allocated funds. Hyderabad needs at least Rs.7000 crore of investment for improving its drainage, sewerage and drinking water facilities. Dr. JP also took exception to the YSRCP proposal to refer policy decisions for prior clearance by the High Court or the Comptroller and Auditor General to preempt charges of corruption. He said that B. R. Ambedkar, whose birth anniversary was celebrated today, did not incorporate such a provision in the Constitution. In such a case, judges themselves could be sworn in as Chief Ministers. Loksatta Party leaders Katari Srinivasa Rao, Bandaru Rammohan Rao, P. Bhaskara Rao, V. Vijayender Reddy and Dr. Suneetha took part in the media conference.